Extreme Pro-6 protein powder must be one of the the worlds number one protein blends. It has a very high protein content and uses the correct proteinsources to give you the full spectrum of amino acids that are found in human muscle tissue. People speak of essential and non essential amino acids, at Extreme Nutrition we believe ALL amino acids are essential. From ion-exchange whey isolate and cold processed whey concentrate to much more slowly-digested casein protein, Extreme Pro 6 sustained-release protein powder blend is designed to be used at any time of the day or night. Due to Extreme Pro-6’s time released properties it remains in your digestive system longer, taking up to 6 hours to digest while giving you a full feeling not associated with whey protein, making it THE protein to use when dieting. 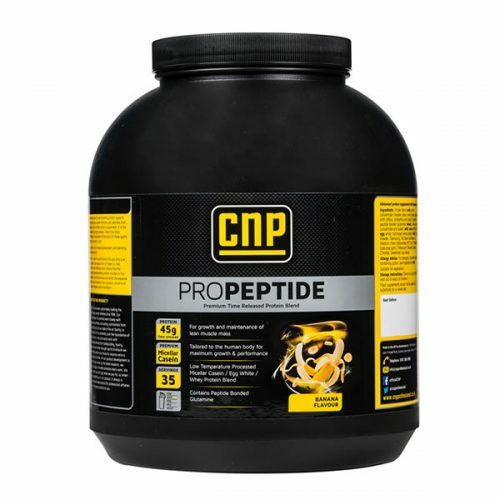 This advanced blend of bioactive fast and slow proteins provides anabolic and anti-catabolic properties, making for better amino acid uptake and less protein wastage. The addition of peptide-bonded glutamine ensures a superior absorption of this vital amino acid which makes up two thirds of human muscle tissue! 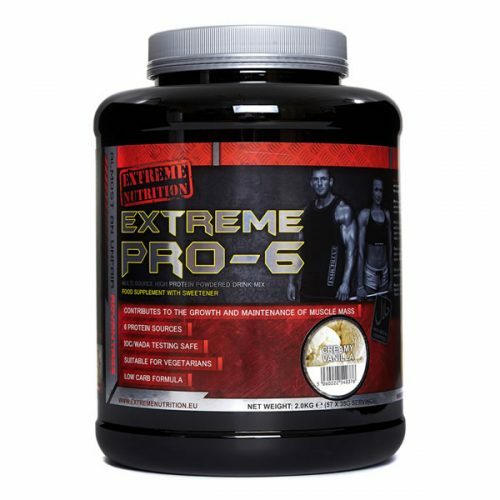 Extreme Pro-6 is low in carbohydrates and fat and is ultra low in sodium and lactose allowing ease of digestion and making it easy on your system. It is the most advanced protein powder supplement on the market today and is ideal for the health conscious individual to the serious athlete. At Extreme Nutrition we are fully aware that no matter how good a product formula is it must still taste great so we have spent a LOT of time on getting the flavours right because if you are to make this your protein of choice you´ve got to like the taste as much as you like the results. We are confident you will like both. Extreme Pro-6 is the perfect choice for you if are looking to add lean muscle mass, looking for enhanced recovery after exercise, looking to help increase your strength or to retain muscle whilst dieting this is for you. If you want a great tasting, time released protein powder that causes no bloating, is easy to absorb, tastes delicious and mixes effortlessly then your protein powder of choice should be Extreme Pro-6.